Guelph Youth Dance Summer Intensive students born 2009-2005, will have the opportunity to train in Contemporary Technique, Jazz, Ballet and Repertoire. There are also a limited number of half day options available. A half day consists of two classes including Contemporary Technique, Ballet or Jazz classes. 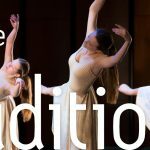 A minimum of 1 year dance experience is required.